Today I was reminded of another, very, famous female chemist I somehow forgot about when I wrote my blog post on the topic a little while ago. Yes, Margaret Thatcher: born 13th October 1925, died today, 8th April 2013. She read Chemistry at Oxford between 1943-1947. How could I, a child of the 80s, forget her? It’s true, she became famous for things other than chemistry, but nevertheless that was her subject. So never mind the politics. What did she do as a chemist? In her final year at Oxford, she specialised in X-ray crystallography under the supervision of Dorothy Hodgkin (another shameful omission on my part – Hodgkin developed the technique of protein crystallography, confirming the structure of penicillin and then determining the structure of vitamin B12, for which she was awarded a Nobel prize). After graduating Thatcher, née Margaret Roberts, worked for BX Plastics. After moving to Dartford, she worked as a research chemist for J. Lyons and Co. in Hammersmith, as part of a team developing emulsifiers for ice cream. So what do emulsifiers do? Well, as everyone knows, oil and water don’t mix. At least, not permanently. You can shake them together temporarily, but they’ll gradually separate. Emulsifiers act as a sort of bridge between the oil and the water. They have a hydrophobic (‘water hating’) end and a hydrophilic (‘water loving’) end. The hydrophobic bit buries itself into oil droplets, whereas the hydrophilic bit hangs out with the water molecules. Emulsifiers keep everything working together; they’re the mediators of the molecular world. There are lots of natural emulsifiers. After all, living things contain fats and water, and it could be potentially problematic if everything kept separating out. In particular, egg yolks contain an emulsifier called lecithin (don’t worry vegans, there’s a soy version too). Next time you’re eating pretty much anything with fat in it (chocolate, ice cream, sauces, salad dressing) check out the label – lecithin is probably on there, or its E number, E322. Anyway, back to Thatcher. What did she do? J. Lyons and Co. tasked her with getting more air into ice cream. The difficulty was keeping it stable, so that it didn’t just collapse into a watery puddle. 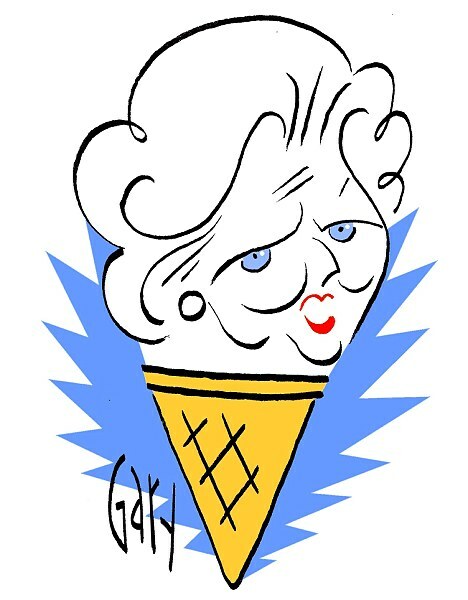 The type of the ice cream that Thatcher worked on is what we call today ‘soft serve‘ ice cream – the stuff that gets squirted out of those machines ice cream vans lug around, and into which you stick a delicious chocolaty flake. Soft serve is has less milk fat (strangely appropriate, given that Thatcher later became famous as the ‘milk snatcher’) and is produced at a higher temperature than normal ice cream, both of which make it cheaper. Thatcher’s team managed to double the amount of air that could be crammed into the mix, and so those big squirty machines and Mr Whippy was born. This entry was posted in Chemists, Everyday chemistry and tagged BX Plastics, Dorothy Hodgkin, emulsifiers, hydrophilic, hydrophobic, Ice cream, J. Lyons and Co., Lecithin, Margaret Thatcher, soft serve, Thatcher by katlday. Bookmark the permalink. I really enjoyed reading this! I had no time for here politics, but it was good to be reminded of her chemistry career. She was indeed the ‘Fe Lady’!